Wow! What a week already! And it’s only Tuesday! I’d like to start by thanking the winning bidder of the Codex Staff that Felicia Day and I made in my first video blog. The auction closed at an astounding $5,319.00! The full amount went to the Red Cross to help in the effort to aid Haiti, Chile, and other places around the world that have suffered from recent natural disasters. I would also like to thank all of the competing bidders who help get the final donation up so high. I’m sorry you didn’t win the prop, but the fact that you all valued it as much as you did means the world to me. I intend to do future projects like the Codex video blog, and donate the proceeds to charities in need, so hopefully some of those items will be of equal interest to you. Along those lines, I am prepping for several new video blogs, featuring interesting projects and very exciting guests. But as you may have guessed, the video blogs take a lot of time to set up, shoot, and post. I will need to space them out a bit, or this blog will become a full time job! So, for the moment, I’ll post copy and pictures to show you what I’m up to. There are all kinds of new things going on. I can’t wait to talk about them! But unfortunately I can’t talk about them yet. But if you liked what you saw in the last few videos, you are going to love what I’m up to next! OK, time to focus on this blog. Looking at the clock, it’s an hour before my birthday! Which means, by the time I post this, it WILL BE my birthday! And I believe that means I can talk about anything I want to! I know I have a list of open topics, like SPD, Guild Xmas props, and BarnYard History. @geekyfanboy will have to figure out how to link all the parts together, since I seem to enjoy skipping around so much! But, hopefully, it keeps it more interesting that way! I thought about all of the new things I have to talk about, but since it is my birthday, I’ve been thinking about all of the things I have done. Maybe I’ve had TOO MANY birthdays, but it seems that gifts and parties aren’t as important anymore. What really matters are the things you do in life that make you happy, and the people that you do them with. I thought about writing a blog about all of the people that are so important to my life, the people that make me who I am, and KEEP me who I am, and help me do what I do so I can show you all of these cool projects. But I realized that that list would be way too long for a blog, and I still would end up leaving people out. And that is truly the best birthday gift I could ever ask for. Since I wrapped up BarnYard History Part 1 with Labou, I’d like to spend the first few hours of my new year talking about that. The film was one of the most interesting experiences of my life, and it will always be near and dear to my heart. This image is one of the reasons I decided to write this blog tonight. I was looking through some photos earlier today, and came across this. That’s a very early rough sculpture of Labou, strapped into my jeep for one of the first meetings with potential financiers. As with most of my writing, I usually lock onto several visuals within the story and start developing them visually as I am putting the words onto paper. The physical realization of the elements in the story help me wrap my mind around what I am trying to say, and usually help me understand the characters and setting better. They also help others understand what’s in my head, hence why Labou is going for a ride! I know, that’s a ridiculous caption, but its true. The story of Labou is about friendship, and it got made because of friendship. That’s Sheri Bryant, my actual best friend in the world. She is also my producing partner. We have a company together, Dog & Rooster Productions. We met at San Diego Comicon many moons ago, and we share a common geek interest in all things alien, futuristic, and cartoon. We have stacks of scripts and stories to produce, but when we put our heads together and tried to boil down what elements really made us respond to the movies we loved as kids, Labou was the end result. Sheri studied business at Stanford, so she is obviously the brains of the group! (I got a t-shirt from the gift shop there once. But I don’t think that qualifies for anything) While I wrote the script and started designing the look of the film, Sheri wrote the business plan and created a strategy for getting the movie made, and more importantly, SOLD! I don’t think there will be any way I could ever say thank you enough to Mr. TG Solomon. He was the gentleman that financed Labou. He wrote the check and let Sheri and I do our thing, and for that I will be eternally grateful. TG loved visiting the set and socializing with the cast and crew. Here he is with Kelson Henderson, in character as Clayton LeRouge. Once the sculpt was done, my buddy Scot Erb helped me make a silicone matrix mold on Labou. The finished mold went to Mark for foam, and Scot packed up a 5-ton truck with props and junk from the yard and drove off to New Orleans. Labou communicates through whistling. I wanted his whistle face to be very distinct, so John Criswell suggested that I have a separate “whistle head”. Here’s the sculpt in progress. To make sure Labou’s whistle lips were right, I had a very dear friend model for me. Can anyone guess whose lips are whistling in this photo? Next up were the eyes. They weren’t modeled after anybody! But they were a very difficult part of the process. The “white” of the eye is cast first, and the pupil and iris get painted onto it by hand. Then that is put into a second mold, and the clear "lens" is cast around it. They often get ruined during that last part, so you have to make a lot of extras. It’s hard to paint them all so meticulously knowing that every other one won’t make it! The funny part of this photo to me is the Santa sculpture to the right. I did a few side projects during Labou to make some money! (The perils of low budget filmmaking!) This one was a Santa popcorn bucket for the Radio City Music Hall Christmas show. I know, you threw yours out! Here is the prototype Labou almost completely assembled. I used this model to help me keep all the various versions of puppets looking uniform. This fiberglass copy still sits in the main room of BarnYard FX. Maybe one of these days I’ll give you a tour! Photo #13: It’s A Sign! We are finally in New Orleans. Well, at least Sheri and I are! The first big hurdle is to set up a functioning production office. We were lucky enough to get space at the Nims Center, New Orleans’s largest production facility. I remember having butterflies in my stomach as I took this photo of Sheri putting our production company name on the marquee. It was finally all real! We were making a movie! Photo #14: Drew drew that! Speaking of butterflies, as I was setting up my office, I got this piece of artwork in the mail. Drew Struzan had done this for a prop in the film, but it was first used as a sign on my door. If I had ever dreamed a dream, this was it. Drew also did the original poster for Labou. This is kind of skipping to the end of the filmmaking process, but I was excited to show you since I already brought him up! I will hold back from what I want to say about Drew Struzan until I can give him his proper forum. I could do a whole series of blogs on this man and his art and still not cover everything I would want to. In short, Drew is a great friend, the most amazing artist I have ever seen, and the single most influential person in my life. I have known Drew personally for more than half my life now, but his art inspired me to take the path I chose even a decade before that. Drew has the uncanny ability to capture all of the excitement, emotion, and splendor of a 2-hour film in a single, perfectly composed image. I consider the quality of his art to be my brass ring, and although I may never be able to grab it myself, it is just as satisfying to sit and stare at it and warm in its brilliance. If you think I’m exaggerating, go check out his site. There’s a link to the right. Don’t worry, this blog will still be here when you get back. Although, I assure you, you will be on his site for hours once you discover the mass amount of incredible work he has done! Back in the Crescent City, Sheri and I started scouting for possible locations. It was hot! Like 100 degrees, 98% humidity hot! We had to comb through the city to find all of the different sets, and locations that looked like locations we wanted but couldn’t shoot at. For instance, we needed a city hall for all the stuff with the mayor. Although we actually had the REAL mayor, we couldn’t use the real city hall. There was too much traffic and business going on. We ended up shooting at Gallier Hall, an old courthouse on Poydras St. I liked the look of the giant columns out front, and the statues of Justice on the stairs. Photo # 16a: Not So Ittsy Bittsy! We also had to spend a lot of time outside the city, scouting the swamps and bayous. There is a lot of wildlife out there! A lot of wildlife that wants to eat you! And it’s not even the big things, like alligators, that are the creepiest! 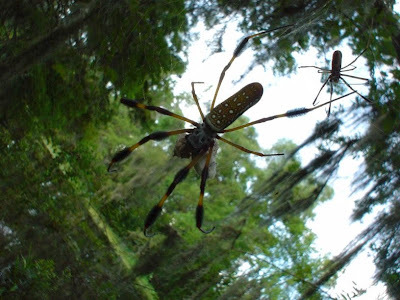 These Banana spiders were my personal phobia. Sheri discovered she was allergic to mosquitoes! And, man, did they love her! Photo #17: Blass from the Past! No, not a spelling error. That’s Dave Blass. If anyone is responsible for me being alive today, it’s Dave Blass! We have know each other for a very, very long time, and Dave has been one of the biggest supporters of my career. He got me my first professional directing gig. He has kept projects flowing through the BarnYard continuously for 15 years. When you look at my IMDB and go, wow, that guy’s worked on a lot of stuff!, most of those projects were by recommendation of Dave Blass. And how do I repay such a great friend? By dragging him down to New Orleans for a fun filled art directing adventure featuring swamps, heat stroke, mosquitoes, and hurricanes! In this photo, Dave is very intrigued by an alligator. Later that summer, when Dave accidentally found himself chest deep in a swamp, the tables had turned. I still so owe you! Sheri found a critter of her own in the swamps. I love this photo. We had so much fun with that raccoon. He was super playful, and made a habit of sleeping ON my head while I walked around. I felt like Daniel Boone. I really wanted to take him back to the BarnYard, but raccoons like to, well, break things. I had flashes of him getting into my MOC original Star Wars 12 back case, and decided he was better of in the wild were he belonged. But, in the meantime, he was very inspirational in terms of movement study for Labou! This was the first day I met Marissa Cuevas. She was a 12-year-old New Orleans local, auditioning for the role of Emily. I know it sounds like a made up after-the-fact story, but I swear I knew we were going to cast her from the second she walked in the room. She just looked like everything I had imagined Emily to be. At first Sheri wasn’t sold, because as good of an actress as Marissa was, she towered over the potential costars. Eventually, as we narrowed it down to Bryan Kitto and Darnell Hamilton, the height difference help fortify the awkwardness of being early teen friends. Marissa rocked the part of Emily, and the role brought her a lot of attention. She moved to LA to pursue her acting career full time, and I am thrilled to be able to still be a part of it. 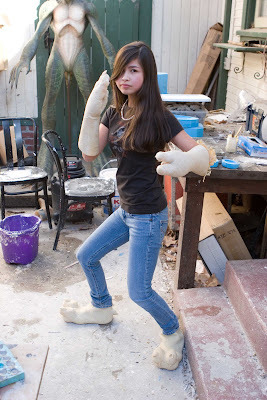 Marissa has acted in several of my other projects, and not always as the sassy teenager. Here she is in a costume fitting for the 100 year old Alien Shaman from Battle Planet. You would never guess it was her! Every story has a villain, and in Labou, there is LeRouge. Captain LeRouge! He is a pirate, sailing the seven seas in search of heirlooms stolen from his family generations ago. Unfortunately, his journey comes to an untimely end. He is forced to haunt the bayous of Louisiana, trying to prevent others from stealing his treasure. I wanted the pirate to have a familiar yet unique look. Costumer Pam Robertson crafted these brilliant costumes for us. One hero, one to be distressed for the “ghost” look. Kinda broke my heart to tear it up! Where there are pirates, there be treasure. I wanted a very specific looking treasure, something harking back to Disney’s pirate ride. Yes, there actually was a ride before there was a movie. And when I was a kid, seeing those skeletons sitting on piles of gold and gems was the most amazing thing in the world. None of the prop houses had exactly what I wanted, so in typical BarnYard fashion, we made it! Here’s Scot creating some giant gemstones. He ended up making a few hundred of them. They looked amazing. The kids actually thought they were real! The other villains in the story are oil tycoons trying to tear down the swamps for a refinery. I knew we would never see the refinery for real, but I wanted to sell how ominous it would be if it ever got built. I had this idea that it would be like a giant metal spider, with legs sticking out everywhere, and a skull made of pipes for a face. I decided to make a “presentation model” of it for the scene in the mayor’s office. Timothy Lee Depriest came in and helped me make it. It had tons of animated parts, and smoke puffed out of the stacks! John Criswell helmed the animatronic front. There were six hero Labou puppets in all, and John machined hundreds of parts for each one. He packed over 20 servos inside each of Labou’s tiny heads. Yeah, that’s Labou and me. We both look pretty happy. For the moment! Wait till you see the photos from the next week! This is two days before filming. I was running some mechanical tests on this stand up puppet before spending the next 40 hours painting all of the Labous. We finally start filming. 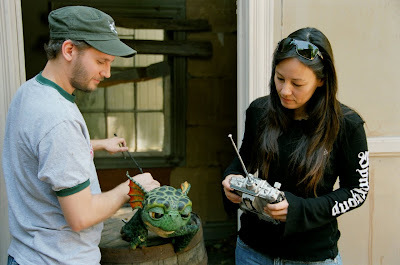 For most of the Labou shots in the film, I would control Labou’s body, and Sheri would puppeteer his face. Being that hands-on is the best part of this kind of filmmaking. I couldn’t imagine being behind a desk and just filtering and relaying information about a project. I like being in the trenches, making the film frame by frame, and I love that my producer is there with me! That’s Adam Lawson, my A.D. When he looks at his watch like that, it means it’s time to go! So, on that note, I will leave the rest of the story to future Labou entries. Believe me, this is just the set up to what becomes a very interesting story! And if you haven’t seen the movie yet, click on the image below and get a copy! Or go to the Labou stuff link to the right and buy some merchandise. It will be like my birthday present! All good things must come to an end. It’s sad, but true. Luckily, we saved the best for last! Not only do I think that this is the funniest of the three “Making the Codex Staff” videos, but this final entry also brings us to announcing the details of how you can own the very prop you have seen being made! I think this video is particularly funny because Felicia and I had already done a full day of working at that bench, probably around 10 hours by the time this portion of the video started filming. We were both a little slap happy, and everything we did seemed funny to us at the time. Hopefully it seems funny to you now! Despite all the laughing, we still managed to create an awesome version of the Codex Staff. It is exactly everything the original prop for the “Do You Want to Date My Avatar” video was, and, in my opinion, even better, because this one was hand crafted by Felicia Day herself! I can’t recall ever hearing about a collectible prop for a character in a show actually made by the creator and star of that show before. I can’t tell you how exciting it is to me that some lucky fan will actually own this! And it’s even better because all of the proceeds from the auction to win it will go to the Red Cross, a charity providing relief for the recent disasters in Haiti and Chile. I will personally pack the staff and mail it to the winner to make sure it arrives intact. And feel free to ask me any questions you may have before you bid. Once again, I want to thank my crew. You did an amazing job filming and prepping everything, and I look forward to working with you all on the next video blog. Brad did a particularly spectacular job this segment, especially in cutting in all the frames that show me at my geekiest! This segment also included another track from the LABOU soundtrack. “Without You I’m a Mess” was written and performed by none other than SPD Green Ranger Matt Austin. After you bid on the staff, go to Netflix and watch Matt’s new documentary on the late John Hughes, “Don’t You Forget About Me”. Lastly, it's the 1st of March, which means it's my good friend Simon Tams's birthday! Simon gave me my first art department job in Hollywood, and my life has never been the same. Everyone who knows Simon should give him a big hug today cause he's awesome. And everybody who doesn't know Simon can still leave birthday wishes for him in the comments! I'll print them out like a giant card! Happy birthday, my friend! Alright, I gotta go start prepping for this next blog. Please sign up to be a member of the BarnYardFX blog by clicking on the "Follow" button to the right. Also, follow me on twitter @gregaronowitz to get updates about new topics and guests. Thank you all so much for visiting, and good luck bidding! Oh, and yes, Felicia, the Clove hitch is real!!!! !